A table at the Rose Bowl flea market in Pasadena. Photo by Eli Duke, via Flickr creative commons. 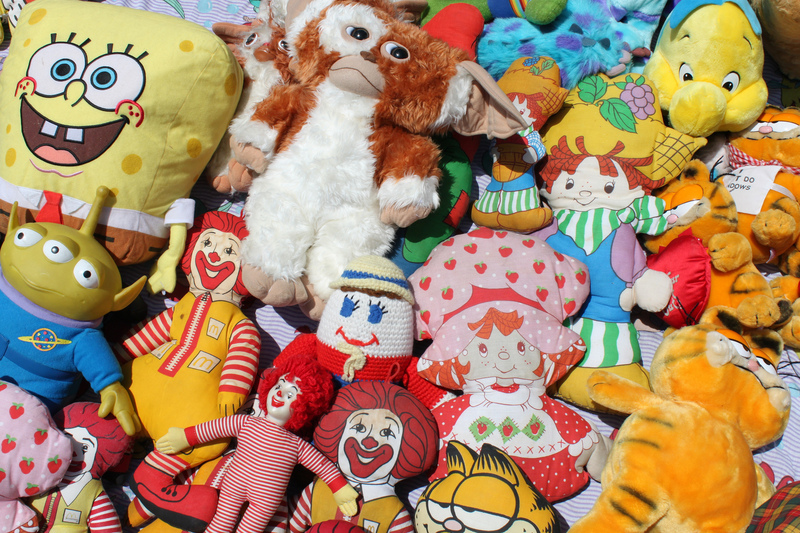 Los Angeles County is known for having great flea markets with something for everyone. Did you know that it’s easy to take transit and bike to go check them out? Here’s a list of the 14 best flea markets across Los Angeles inspired by Racked LA and Apartment Therapy. For each flea market we suggest bicycle directions from the closest Metro rail stop and note the nearby bicycle friendly streets. Schedule: quarterly; 10 a.m. to 6 p.m.
Next Flea Market: April 2-3. Admission: general admission $12, preview admission $20, weekend pass $28. Type: vintage clothing, accessories and jewelry. Metro Rail Station: 7th/Metro (Red, Blue and Expo Lines). Main Street and Spring Street coming from the northwest. Grand Avenue and Olive Street coming from the southeast. Schedule: Third Saturday and Sunday of the month; 11 a.m. to 5 p.m.
Next Flea Market: February 20-21. Type: art, design, vintage and upcycled merchandise. S. Central Ave is a nearby north-south bicycle friendly street. Schedule: every Friday, Saturday and Sunday; 11 a.m. to 7 p.m. Type: new and vintage apparel, furniture, jewelry and more. Metro Rail Station: Pershing Square (Red Line). Schedule: first Sunday of the month; 8 a.m. to 3 p.m.
Next Flea Market: March 5. Metro Rail Station: Allen (Gold Line). S. Hill Avenue running north-south. S. Allen Avenue running north-south. San Pasqual Street running east-west. E California Boulevard running east-west. Schedule: Second Sunday of the month; 9 a.m. to 4 p.m.
Next Flea Market: February 14. Admission: $8 general, $10 express (8 a.m. entry), $15 early bird (7 a.m. entry), $20 VIP preview (5 a.m. entry); free for kids 12 and under. Type of goods: furniture and clothing, among many other things. Metro Rail Station: Memorial Park (Gold Line). Linda Vista Avenue running north-south. W. Howard Street running east-west. Schedule: Third Sunday of the month; 6 a.m. to 3 p.m.
Next Flea Market: February 21. Admission: Free; parking is $5 from 6 a.m. to 8 a.m., $2 from 8 a.m. to 12 p.m. and free after noon. Type: vintage and antique decor, home goods, and miscellaneous items. Glendale Metrolink Station (Antelope Valley Line). If you are arriving from North of the swap meet, N. Verdugo Rd is a north-south bicycle friendly street. Schedule: Second Saturday of the month; 12 a.m. to 5 p.m.
Next Flea Market: February 13. Type of Goods: Vintage, art, handmade, collectibles items. Metro Rail Station: Sunset and Vermont (Red Line). Silver Lake Boulevard running north-south. Schedule: Every third Sunday of each month; 11 a.m. to 4 p.m. Type of Goods: local designers and vintage clothes, arts and crafts and accessories. Metro Rail Station: Hollywood and Vine (Red line). running north-south on Wilcox Avenue. Schedule: Every Sunday; 9 a.m. to 5 p.m. Type: antique furniture, vintage and new clothing, jewelry and accessories. Metro Rail Station: Hollywood and Highland (Red Line). Willoughby Ave is a nearby bicycle-friendly street running east-west. Schedule: first and fourth Sunday of the month; 8 a.m. to 3 p.m.
Next Flea Market: February 28. Admission: First Sunday, $4; fourth Sunday, $5 general admission and $7 early bird. Type: vintage furniture, decor, clothing and jewelry. Metro Rail Station: Culver City (Expo Line). The nearby streets with dedicated bike lanes are Ocean Park Boulevard, Rose Avenue and Venice Boulevard. The nearby bicycle friendly streets are Ashland Avenue and Airport Avenue. Schedule: Second and forth Saturday of the month; 9 a.m. to 4 p.m. Type of Goods: antiques, decor, arts and crafts, vintage clothing and jewelry. There are dedicated bike lanes on Venice Boulevard. Schedule: First and forth Saturday of the month; 11 a.m. to 5 p.m. Type of Goods: art, design, vintage and upcycled merchandise. There are dedicated bike lanes on Main Street and Abbot Kinney Boulevard. Schedule: Third Sunday of the month; 6:30 a.m. to 2 p.m.
Next Flea Market: Sunday, February 21. Admission: $6 general, $12 early bird (entry at 5:30am), free for kids 12 and under; discount of 50 cents offered on website. Type: vintage, antiques and collectibles. Metro Rail Station: Wardlow (Blue Line). running north-south on N. Bellflower Boulevard. running east-west on Wardlow Road. Schedule: Every Saturday of the month; 9 a.m. to 5 p.m.
Next Flea Market: Saturday, February 13. Type: vintage clothing, accessories, and home goods. Metro Station: Pierce College (Orange Line). All bicycle directions are for planning purposes only and riders should consult a map and all relevant safety rules here before travel. There is a swap meet at Citrus College every Sunday. It’s right off the Gold Line APU/Citrus Station! The San Gabriel Valley has some great swap meets. In addition to the Citrus College swap meet at the old drive-in, there’s the Nogales High swap meet at Nogales and La Puente (about half a mile from the 194 bus) and the Star-Lite Swap Meet off of Rosemead Boulevard, a short distance away from the 70/770 bus and the Rio Hondo bike path. Great article! Very useful for future flea market endeavors!